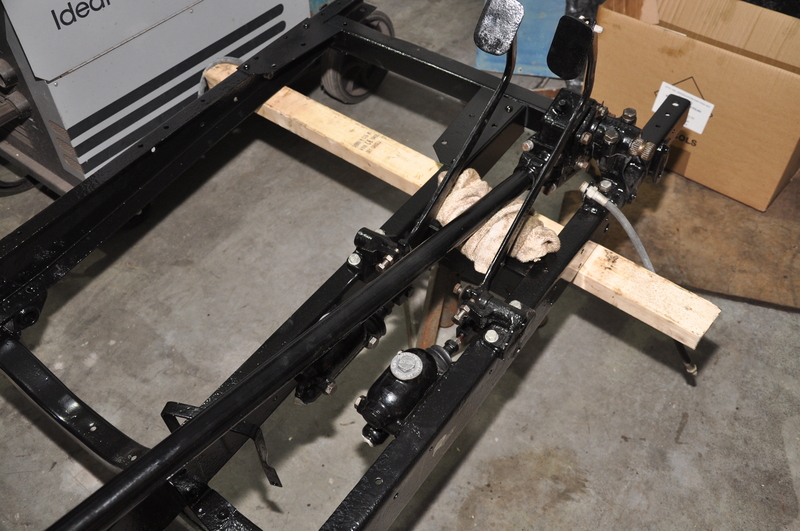 The chassis is now back from the powder coaters. 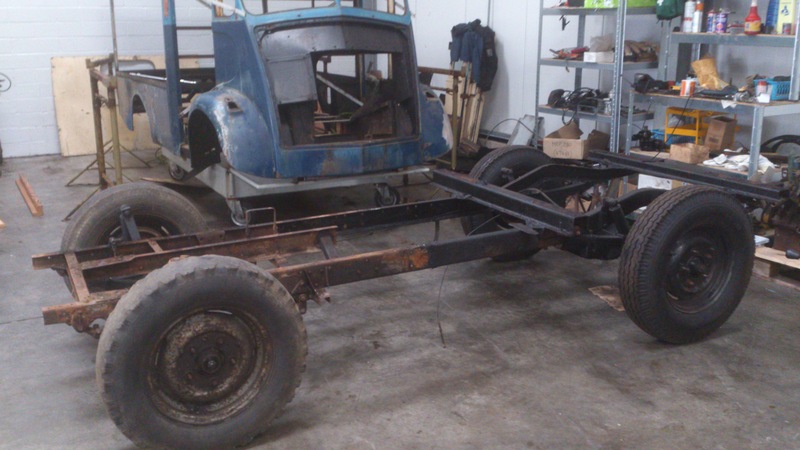 I’ve said before that when you are restoring old vehicles, everything takes longer than you expect. 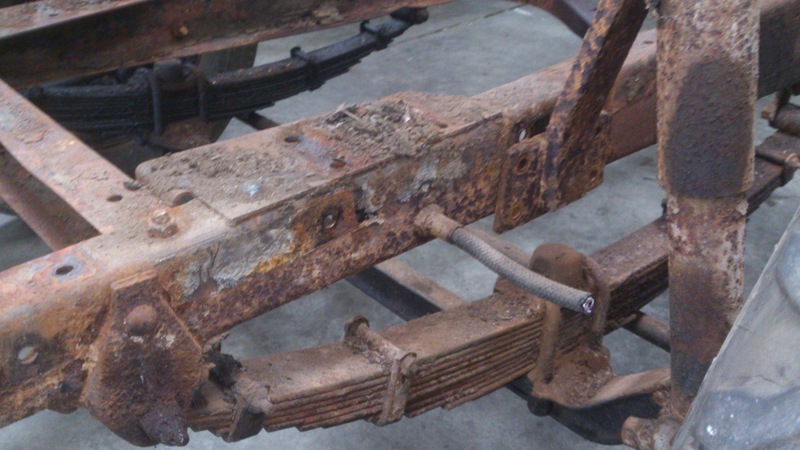 I think the chassis work has been spread out over about three months. 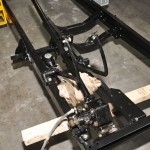 However, you can see from the gallery images above that the chassis looks great. 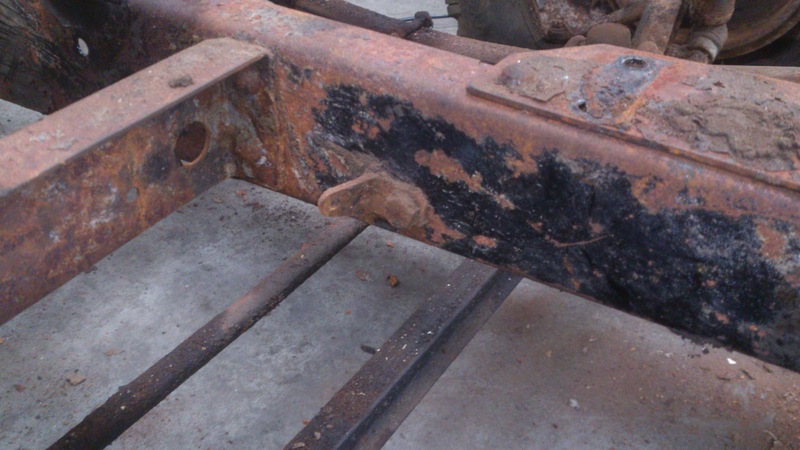 It is heavily pock marked due to the corrosion and the bead blasting process but there are plans afoot to have it looking better. Check back on that one in about a years time! Another point to note is the yellow battery box. 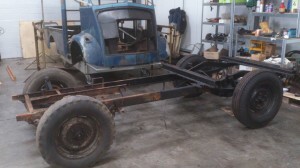 This is much bigger than normal and I think this would be an addition by the coach builders to reflect the fact that it is a milk float and would have a larger battery to reflect the stop – starting that it would probably do. The springs have also been cleaned up and painted. 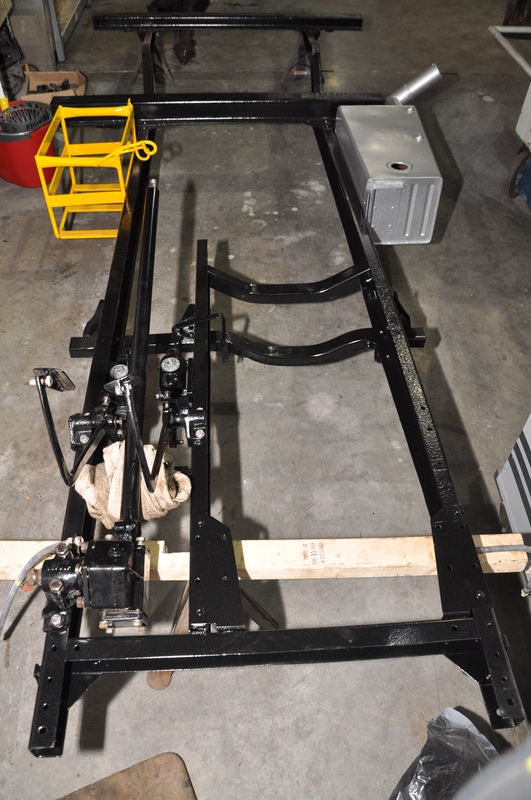 Here they are lying together waiting to be bolted up. 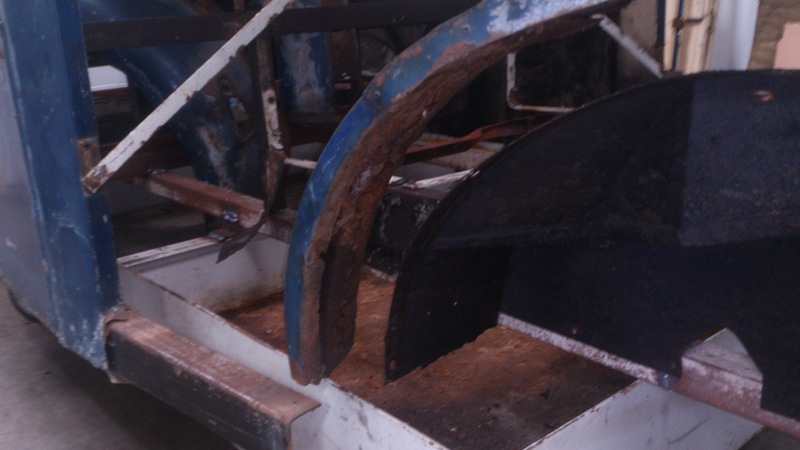 Unfortunately if you look at the bottom spring about midway down just to the left you can see that one of the leaves is broken. A replacement leaf is being sought at the moment. 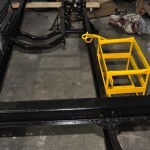 It had been decided to completely strip the chassis and have it powder coated for long term protection. 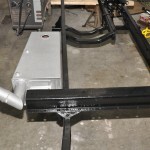 We gave thought to many ideas such as galvanising but having taken advice from our painters it was felt that the powder coating would give the best results. You can see from the attached photos that the chassis was certainly severely corroded but generally fairly solid. 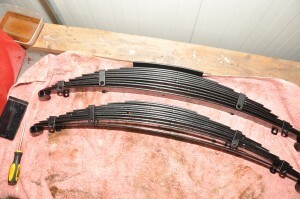 Having it bead blasted would show up any further weaknesses. It is also very useful taking pictures like this as you are going along as a reminder of where everything goes as at the build up stage it is going to become one giant jigsaw! The chassis was completely stripped to the last nut and bolt, suspension removed, rear and front axles removed, brakes completely stripped etc. 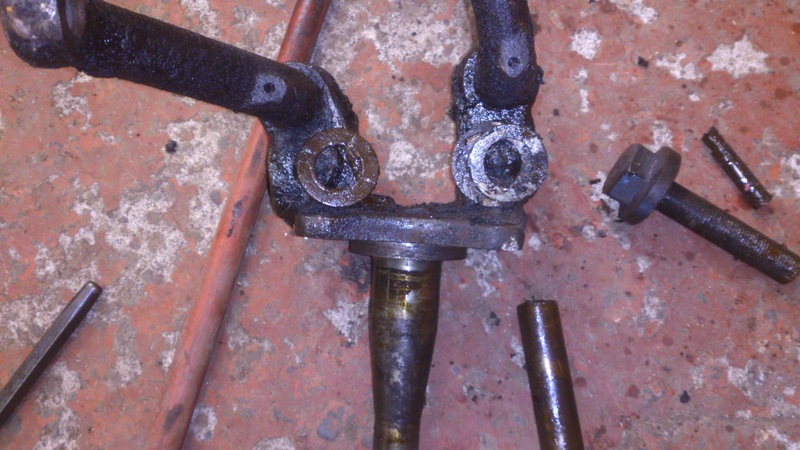 I had originally planned to strip and overhaul the brake cylinders but at the time of writing this article I had realised they were too far gone. New cylinders have been sourced and are on their way at the moment. 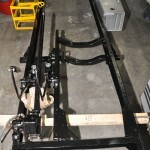 The image on the right shows the rear chassis in more detail. You can see from this that the policy of spraying the chassis with old engine oil after each service has helped to keep it in generally good condition. 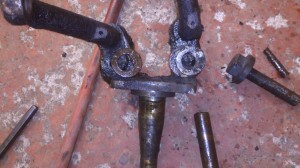 The photo on the left shows one of the stub axles after the pins were removed. This was another photo that was taken simply as a reminder where everything went. 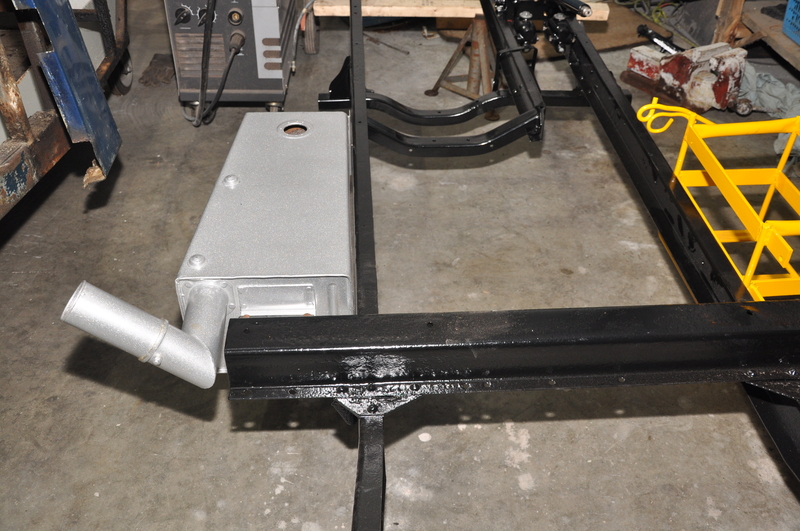 The outriggers that sit under the floor pan were badly corroded so the chassis was temporarily brought back from the bead blasters for new sections to be welded into place before the powder coating. 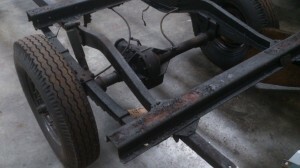 These have been cut shorter than other vans. I think this is also a coach builder modification as they may have been deemed ‘surplus to requirement’. 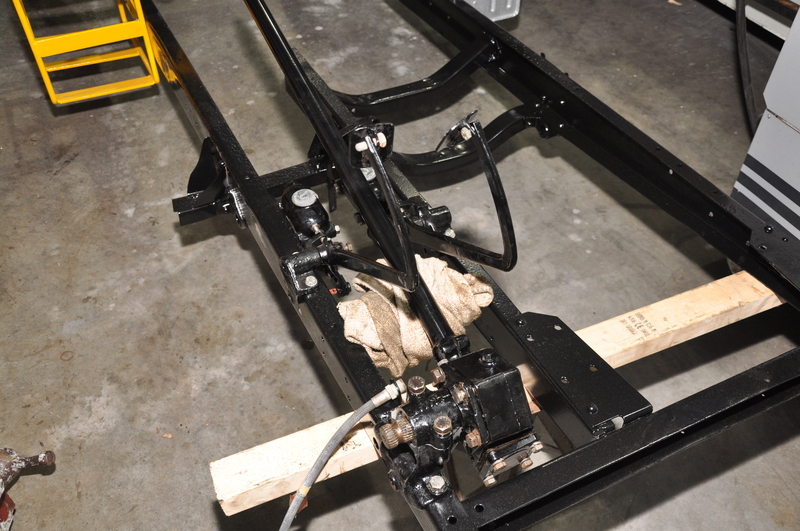 With the cradle for the body manufactured, the next stage was to separate the body from the chassis. 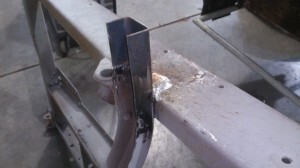 This allowed the work to continue in two separate directions. 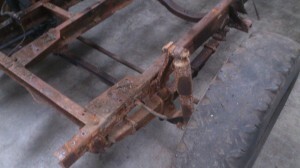 Obviously it will allow the body to be worked on separately but it also allowed the complete stripping of the chassis. The question was how to lift the body safely with limited resources. The image to the right shows the result. 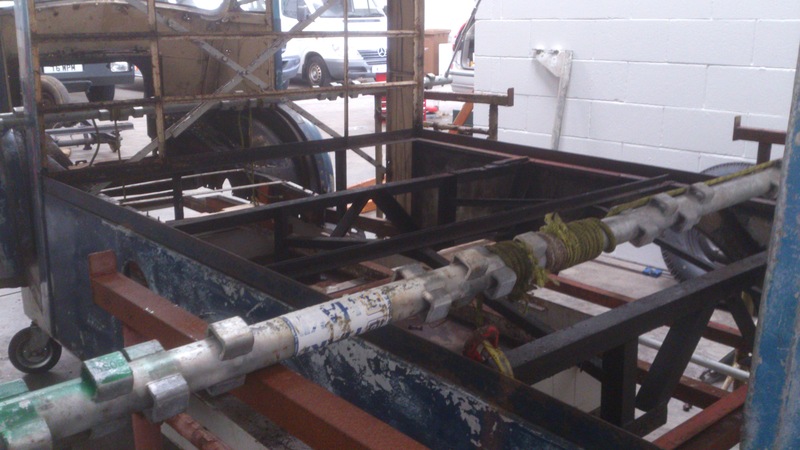 Scaffold bars wrapped with rope were fitted to the front and rear. 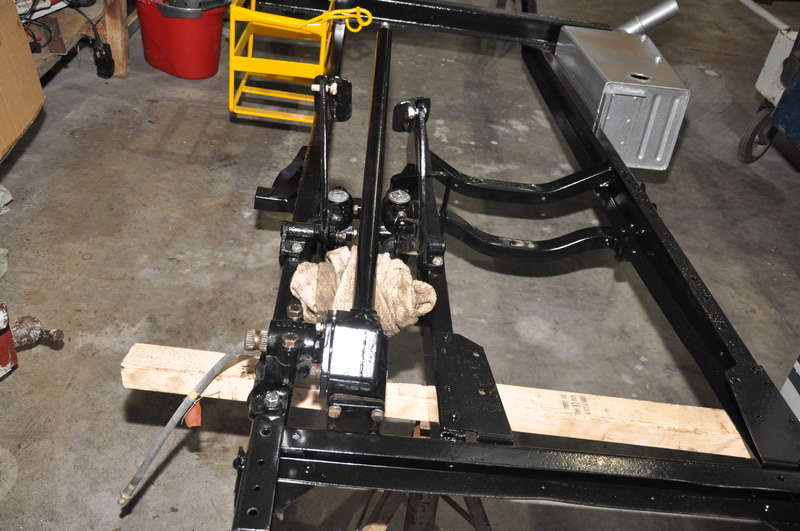 By turning and locking the bars a little at a time the body was lifted clear of the chassis. 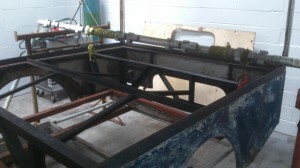 The plan was to have the chassis bead blasted, some repair work to be done and then powder coated. Unfortunately when it was bead blasted despite being given a coat of primer the chassis decided it’s ultimate ambition was to gain a coat of rust. 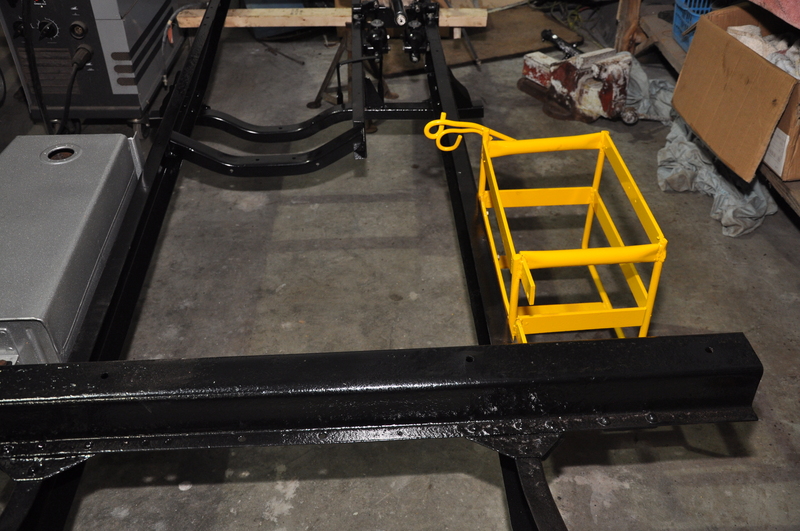 This meant that some time had to be spent on rust treatment and prevention then a final coat of primer was applied and sent to be powder coated. 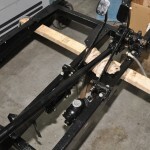 It was decided at this stage after consultation with the powder coaters that it would be re-bead blasted in order to give it the best finish prior to coating. 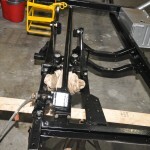 The chassis and body separated. It should be made quite clear at this point that this is how I managed to do it and I am in no way recomending it to anyone else. Anyone carrying out a similar task should be well aware of their own safety concerns and knowledge of tools and equipment.